After an afternoon of traipsing around in the snow and sun, we headed back into the city with a strong craving for comfort food with a spicy kick. 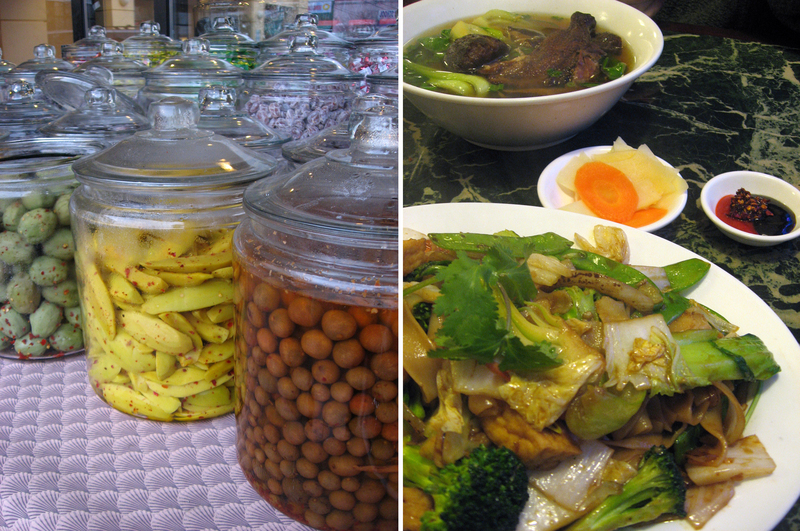 Always searching the International District for new “hole in the wall” finds, we stumbled upon a good recommendation of Hue Ky Mi Gia – a Chinese, Cantonese and Vietnamese combination restaurant – and decided to try it. While the ambiance is pretty straight forward, the friendliest wait staff in Seattle make up for it. Pegged as newbies to the restaurant (we did kind of stick out as the only snowshoe-gear-clad white folks), our waitress explained everything from what they are most known for (their broth based dishes) to what the best ratio of hoisin sauce to chillis worked for each dish. Shawn closed the menu when she said the hands-down favorite dish was the slow-cooked duck noddle soup and I ordered the chow fun noodles with “gravy”, veggies and tofu. Swiftly the dishes were in front of us – Shawn’s soup with the richly flavored soup with the delicate duck pleased him from the first taste. I definitely felt like I needed to add the hoisin/chilli mix and Sriracha sauce to liven mine up a little, but it more than delivered on the comfort food factor, fresh crisp veggies and crispy tofu. All lovely and for the price, really can’t be beat. Hue Ky Mi Gia can be found at: 1207 S Jackson St, Ste 101. I don’t normally eat bagels for once reason or another – they’ve just fallen off my radar as at least the Seattle version’s over-sized, doughy selves just don’t do that much for me – but my friend Romi turned me on to this new place when she brought Eltana bagels to a recent brunch. I knew something was different with these small gems – and apparently that difference is made by being hand-rolled, honey-water boiled, and wood-fired (as they say on their website – three-hyphen bagels!). 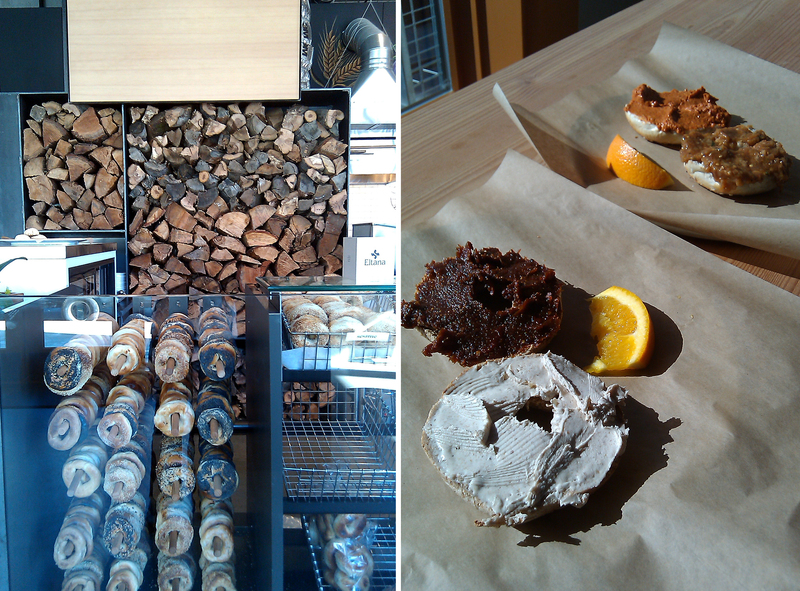 I learned when visiting this well designed space at 12th & Pike, that this is a Montreal style bagel. And while the bread part is exceptionally good – I think it is actually the spreads that were the magic component. Shawn and I each got a bagel, with two different spreads so that we could try 4 – 2 sweet and 2 savory. Our hands-down favorite was the date walnut cream cheese – but all were incredible, including: red pepper and walnut (for those of you that know my romesco – very similar! ), eggplant pomegranate (who would have known those two would have gone together, much less make something so lovely?) and apricot fig compote (earthy and not too sweet – my only complaint with this one is that it might need a lighter application). Some very good coffee, a daily crossword tearsheet, along with the sunny window perch made for a very contented girl.